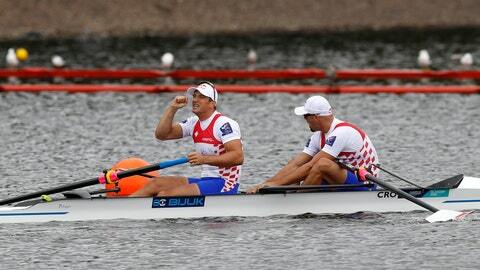 MOTHERWELL, Scotland (AP) — Two years after earning Croatia’s first Olympic gold medal in rowing, the Sinkovic brothers have won a major title again — in a different discipline. Valent and Martin Sinkovic won the men’s pair final of the European Championships at Strathclyde Country Park on Saturday, having switched from the double sculls after their Rio de Janeiro triumph to give themselves a new challenge. Clocking the fastest time in qualifying, the Croatian brothers started the final as favorites but had to overcome fierce resistance from another pair of brothers, Valentin and Theophile Onfroy. The Frenchmen led the race from scratch and were still ahead by 1.25 seconds at the 1,000-meter mark. In one of their trademark strong finishes, however, the Sinkovic brothers overtook their rivals on the final 250 meters and beat them by less than a second. They pumped their fist, and briefly shook hands to celebrate their victory. Valent, who turned 30 on Thursday, has been competing with his younger brother for 10 years on an international level. Their first major successes came in the quadruple sculls, most notably in 2012 when they won the European title in Varese and Olympic silver in London, teaming up with David Sain and Damir Martin. The brothers continued in the double sculls. They became the first pair to break the six-minute mark, and they racked up back-to-back world titles in 2014-15, the European Championships in 2016 and, three months later, ultimately, the Olympic gold medal. Having dominated the discipline, they decided they needed a new challenge approaching the Tokyo Games in 2020. How about making a rare move and winning Olympic gold in another discipline? They found it far from easy to start with and even considered switching back to double skulls. But slowly they found their rhythm — taking home a surprise silver medal from the worlds in Sarasota, Florida, in September — and started winning races this year. They landed their first victory in pair at a World Cup in Belgrade in June, and broke a 23-year-old course record from British rowing greats Steve Redgrave and Matthew Pinsent at the Henley Royal Regatta in July. “We are still not 100 percent used to the pairs. We have our ups-and-downs. But it is going better and better so we are confident for the final preparations for the worlds,” said Martin Sinkovic, referring to the world championships in Plovdiv, Bulgaria, next month. Despite approaching the top in a new discipline, the Sinkovic brothers are still reluctant to dream aloud about Tokyo 2020.